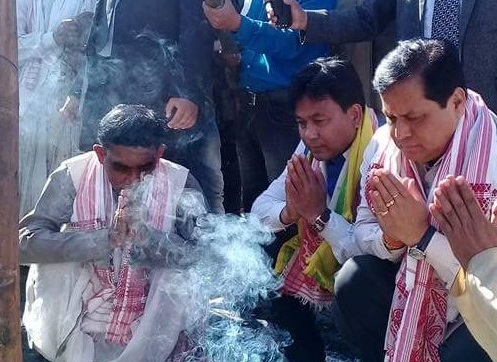 Chief Minister Sarbananda Sonowal on Wednesday laid the ‘Lai Khuta’ for holding the 74th edition of Buridehing-Bordumsa conference of the Axom Sahitya Sabha. Addressing the gathering at Bodusa Samanya Khetra at Bordumsa in Tinsukia district the chief minister assured of extending all possible aids and services for the success of the programme slated to be held from February 1 to 4 next. 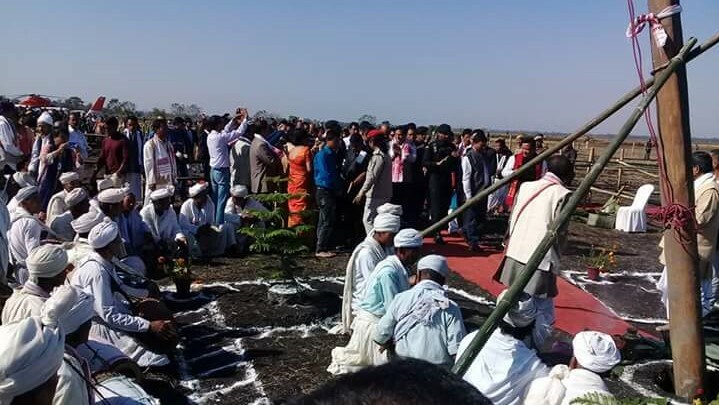 Speaking about the role and significance of the Axom Sahitya Sabha, Sonowal also said that the episode this time being at the border location like Bordumsa would go a long way to strengthen the bond of fraternity, mutual trust and peace, promoting parallel development with the neighbouring state of Arunachal Pradesh. The chief minister was accompanied by a host of local MLA s and MPs, local civil and police officials beside the office bearers of the Axom Sahitya Sabha including general secretary Paramananda Rajbongshi. Head gaonburah of Bordumsa circle in Changlang district Sikhetang Singpho accompanied by Nongsa Singpho a social worker, Dumsa Nong Singpho the son of famous Singpho Jamadar during the British regime in India and Senai Wangno a religious tribal leader of Nockte community from the neighbouring Arunachal Pradesh gifted Sonowal with tribal headgear, traditional dao and tribal bag. Earlier in the morning a vivid cultural presentation stole the moments amidst huge gatherings followed by the hoisting Axom Sahitya Sabha flags and rendition of Assamese patriotic songs.